Grease a 20cm cake tin and line with parchment paper. Sieve the self-raising flour and 80g of the plain flour into a bowl. In a separate bowl beat together the sugar and butter until pale and creamy, then add the eggs and combine. Add the flours and finish with the milk if desired. 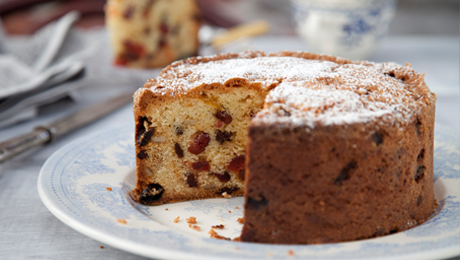 Put the candied fruit in a small bowl and sprinkle with 2 tablespoons of flour so the fruit doesn’t sink to the bottom of the cake. Add the fruit to the cake batter, then pour into the prepared tin. Bake for about 1 hour 30 minutes. Test the cake by lightly pressing the centre. If baked, it should spring back and the top should be golden brown. Alternatively, pierce the cake with a metal skewer. The skewer should come away cleanly once cooked. Remove the cake from the oven and leave in the tin for 5 to 10 minutes, then invert onto a wire tray to cool. Decorate as desired.